Kalmia angustifolia.M. B. Gargiullo (2009). 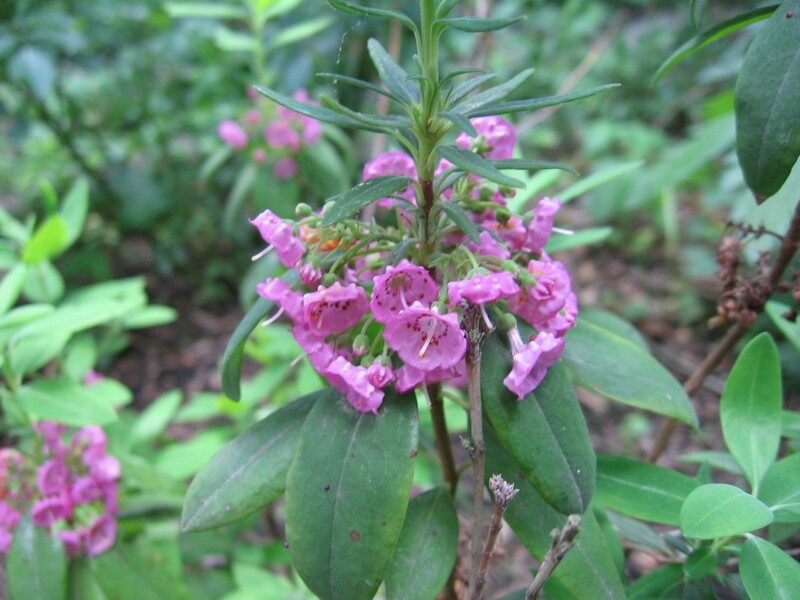 Kalmia angustifolia is an evergreen shrub to 1.7 m tall; colonial from extensive rhizomes, also from stem layering (Mallick 1993); roots associated with highly specialized ascomycota ericoid mycorrhizae (Berliner and Torrey 1989), taproot on older plants may extend down to 1 m (Allen1991). Leaves opposite or in whorls of three, evergreen, dull blue-green, often reddish in winter, to 5 cm long, narrowly elliptic. Flowers pink, showy, petals fused in an angular-bowl shape, to 1.2 cm wide, anthers are in pockets on the inner surface of the corolla; flower clusters near ends of stems; blooms May-July, pollinated by the bumble bees Bombus terricola and B. ternarius and by the solitary bees Andrena lata, A. carlini and Dialictus cressonii. Also self pollinated (Rathcke 1988). Fruit a dry, 5-parted capsule, rounded, 0.4 cm wide, splitting open to release an average of 182 small (< 0.1 cm) seeds. Habitat: Undisturbed, open oak woods in acid soil, on sterile, sandy soils, along wetland edges and uplands. Soil pH 4.5-6, oak or pine woods, barrens, bog edges. Tolerant of moderate shade, flooding, drought, soil compaction (Hightshoe 1988). Adapted to fire, resprouting after a burn. Resistant to salt. Notes: Foliage apparently toxic due to andromedotoxin (Hall et al. 1973). Attacked by very few insects except a few sawflies and cutworms that do not cause much damage. Leaves infected by several fungi including the Mastigomycotina Synchytrium vaccinii and the Ascomycotina Gibbera kalmiae, Gibberidea kalmlae, Lophodermium exaridum (a leaf disease), Mycosphaerella colorata (Didymella), a leaf spot disease, and Phyllachora kalmiae (Hall et al. 1973; Agrios 1988; Sinclair et al. 1987).